Published in 2012, The Walking Dead: The Road to Woodbury, by Jay R. Bonansinga and Robert Kirkman, is a follow-up novel to The Walking Dead: Rise of the Governor. Like its predecessor, it follows a group of survivors trying to stay alive in the post-apocalyptic zombie world of The Walking Dead. The Walking Dead: The Road to Woodbury, is told from the point of view of Lilly Caul, a fearful and anxiety-ridden young woman who trembles in fear at the slightest sound. Her character is developed as someone who's spent her life running from everything -- relationships, responsibility, you name it -- before and now after the zombie apocalypse. 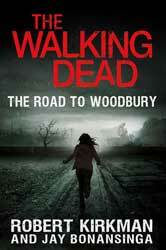 Like Rise of the Governor, The Road to Woodbury is written in present tense that takes a little getting used to. One of my complaints is what seems to be the authors' preferences for telling instead of showing. We are constantly reminded that Lilly is a fearful neurotic, Josh is a gentle giant hero, Bob is a feckless yet kind-hearted drunk, Meagan is a camp whore and pot-head.... etc. The book starts with our group being part of a larger group currently occupying a tent city located somewhere in Georgia. A series of unfortunate events results in Lilly being kicked out of the group. When this happens, the rest decide to go with her. Based on the way the camp was being run, I don't blame them. The first half of the book is Lilly and her new group seeking safety and having a few skirmishes with roving bands of zombies. Then they meet Martinez, one of the Governor;s henchmen, who convinces them to come to the safety of Woodbury. Walking Dead fan or not, most of you reading this will have heard of the Governor, one Philip Blake who runs the town of Woodbury. Unfortunately, Woodbury doesn't exactly turnout to be the panacea of safety they thought it would be (no surprise here). One of the things I do when I read is ask myself, "self, what would YOU do in such a circumstance." Now it's just a thought game to be sure, but honestly, my answer is frequently something different than what the characters here decide to do. I suppose if they were completely unconcerned with survival, some of the things they do would make sense. Yet we're led to believe that they want to survive, even though their actions and decisions seem to be counter to common sense. Segue here, but I often have the same thought when watching the show. If I was at risk of running into a zombie at any moment, I wouldn't be running around in a wife-beater or T-shirt. I'd be in work boots, jeans, long-sleeve shirt and a jean jacket at a minimum, probably with something wrapped around my neck and on my head as well. That's what it takes to survive an encounter with a zombie long enough to get your own licks in. In the end, Road to Woodbury is really just about the adventures of a group of people trying to survive. There's no ring to destroy, or alien artifact to discover, or ultimate enemy (save perhaps the zombies themselves) to be defeated. Motivations seem to be nothing more than make it to the next day. Realistic? Sure, but not having an ultimate goal neuters the story. Kirkman isn't shy about killing off characters, so at least there's that tension there. Still, The Road to Woodbury is fun enough. There's plenty of gory description and end-of-the-world fun to be had. It expands on the world of The Walking Dead in an enjoyable way, fleshes out some of the characters comic and show fans might be familiar with, and gives us a chance to have our own apocalyptic zombie adventure. 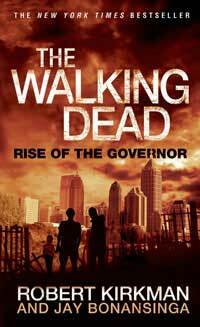 It goes without saying that if you're a Walking Dead fan you'll enjoy this book. End-of-the-world aficionados will as well. Newcomers might less willing to swallow some of the weaknesses I mentioned above.